Attention Hummvee / Hummer Owners!! Brand new in the box Sure Power DC-DC converters. Input is 24v DC nominal and output is half the input at up to 25 amp. Use for a brute 12v DC supply or as a multi-voltage management system. Charge single and multiple 12v battery banks. Fused input and outputs. Voltage trim. Negative ground. 6-5/8" x 8-5/8" x 2-1/2" high. New!!! 100 in stock. NSN: 6110-01-348-6621. 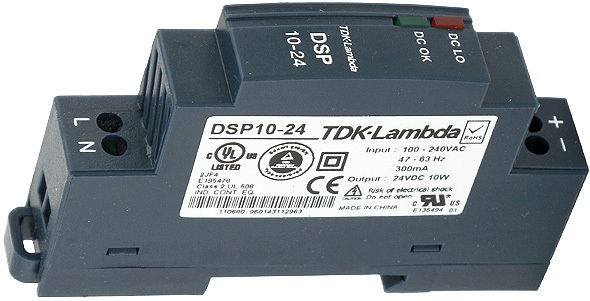 TDK-Lambda power supply. New in box with manual. ROHS compliant. 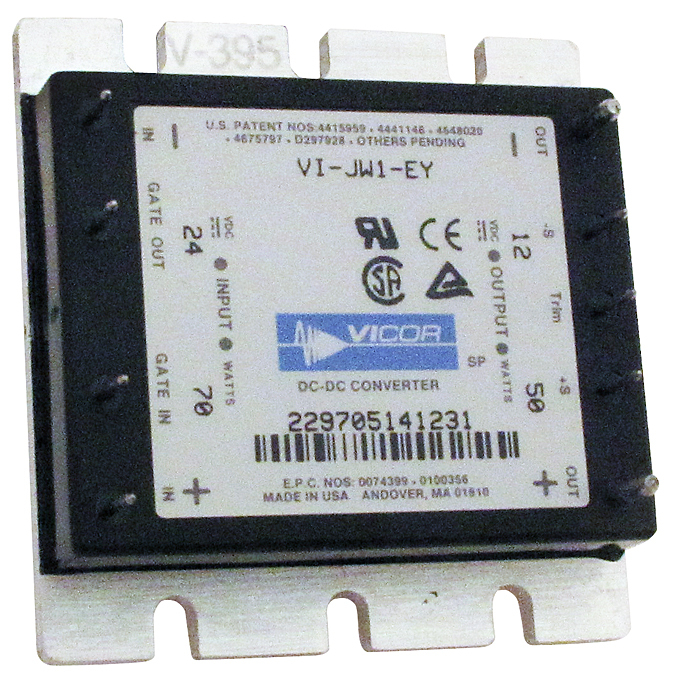 Powerful Vicor Mini-Mod DC-DC converter. Generates 50 watts of 12v DC power with 24v DC input. Input range 18-36v DC. Remote sense, current limit, (UL, CSA, TUV, VDE, BABT) approved. 2-5/16" wide by 2-3/8" deep by 1/2" high body (+ 1/4" terminals). Aluminum heatsink base. Solder terminals on top. Factory packaging is 2 per container. Will separate. New. Condor linear supply in open frame chassis. 0.05% line and load regulation. Auto current limit and fold back. Used. 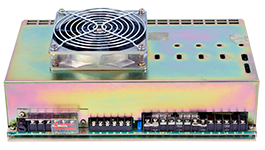 Sola linear power supply in open frame chassis. 0.05% line and load regulation. Ripple: 3.0 mV maximum peak-to-peak. 24v DC ± 5% at 3.6 amp out. Voltage & current limit adjustments sealed. Jumpered for 100/120v input. 7 lbs. • Output: 24v DC @ 3.6 amp. • Frequency Range: 47-63 Hz. (Typical is 60 Hz derate output 10% at 50 Hz). 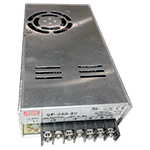 • Transient Response Time: 50 µSEC at 50% load changes for outputs rated to 6 A. 100 µSEC at 50% load changes for outputs rated 6 amp and over. 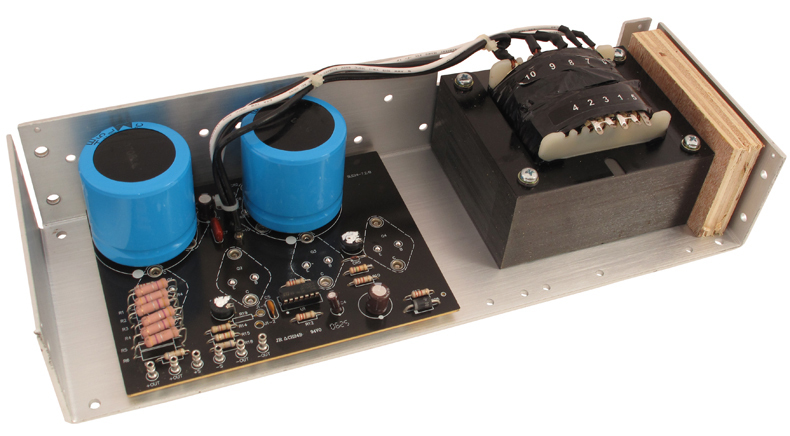 • Dimensions: 7" x 5" x 3-1/2"
Soundolier husky power supply. Non-regulated but plenty of room to add a circuit. Ventilated cabinet top. Fused, terminal strip outlet. NSN: 6130-01-073-8768. 100/120/220/230/340v 47/63Hz single phase input. 24v DC, 7.2 amp, 170w linear regulated output. Open frame. 14"L x 4.13"W x 2.75"H, 10lbs. Meets UL, CAS TUV standards. Technipower, a new, awesomely brutal power supply. Brick solid... as a battery. 105-125 vac, 50-70 Hz input yields a ultra conservative, pure 24.1v DC @ 12 amp out nominal. Trimmable 23 - 25v DC. Will not dip, sag or give in. 45 pounds. Hermetically sealed. 4-7/8" x 7" x 13" long. 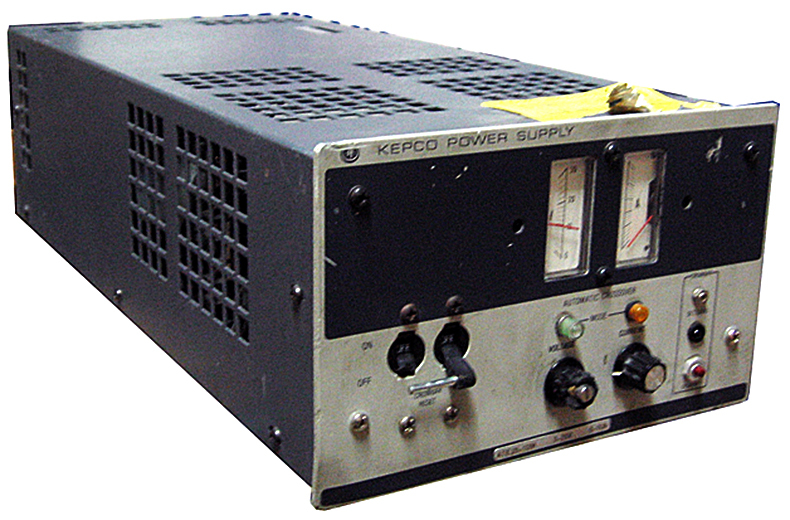 Kepco, variable supply with dual meters. 0-25v DC, 0-10 amp, front panel adjustable voltage and current limiting, dual meters. Binding post outputs on rear. Used, repairable, not working, rough condition. Sold as-is. 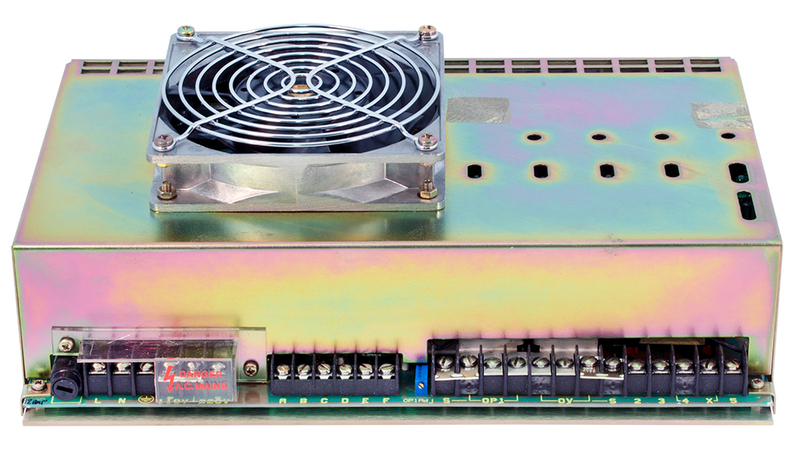 PowerOne multi-voltage switcher power supply. Power factor correction design. New, old stock. OEM $300 each. • Dimensions: 9" x 5" x 2-1/2"
24v DC ± 2v DC @ 3 amp @ 20 a.h.
UPS - Standby power supply. 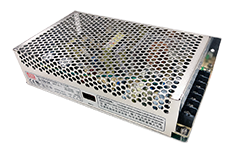 This milspec Austron supply provides a constant 24v DC, even in the event of power outage. Brand new in original boxes. Includes manual. • Requires two 12v, 20 a.h. Gelcells NOT INCLUDED!! Government Cost = $5,715. NSN: 6130-01-164-0547. NEW, removed from CELL-LOC outdoor cabinet, never put in service. 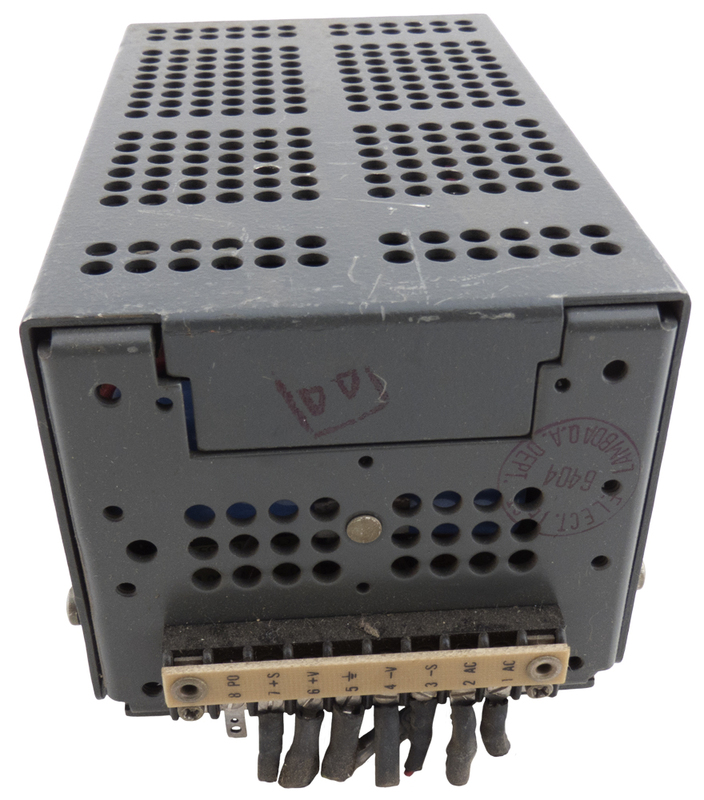 Switching Power Supply made by Prologic Controls is made up of five 10 amp internal supplies. 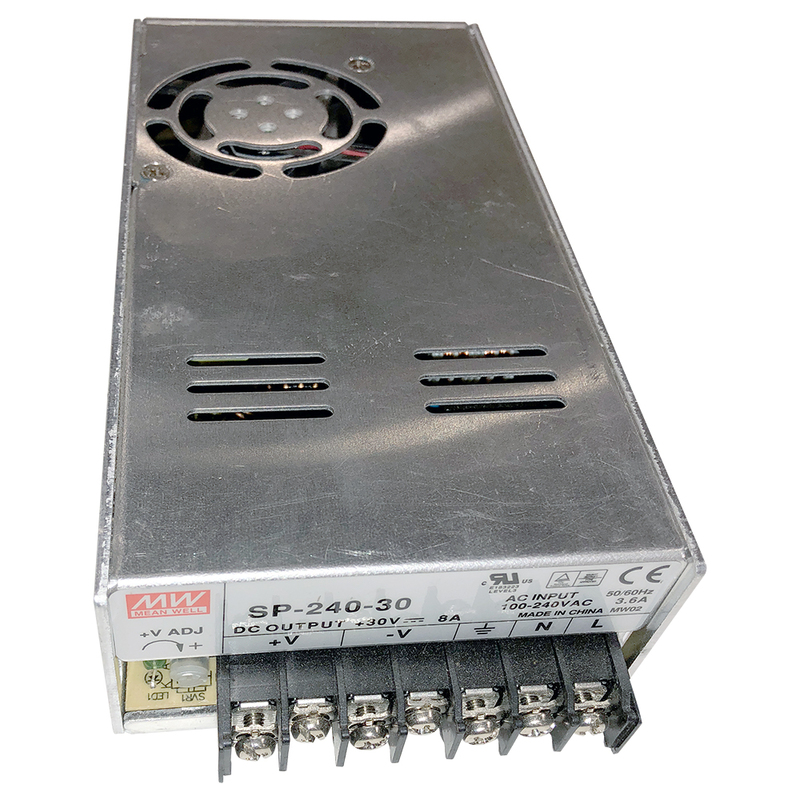 The PLC-2450 has 5 modules internally daisy chained and rated @ 50 amp. Output terminals L1 and L2 provide full output to power equipment. Output terminals B1 and B2 connect to external batteries to charge them when ac power is available and automatically provide battery power to the load when ac power fails. DB-25 on rear panel provides module status outputs, temperature fault output, dc output and 5v DC at 250 mA.Mounting holes show wear from mounting screw removal. 1. Battery charger for pair of 12v (13.8v nominal) batteries in series. Thismakes a bullet proof 28v DC power supply. 2. 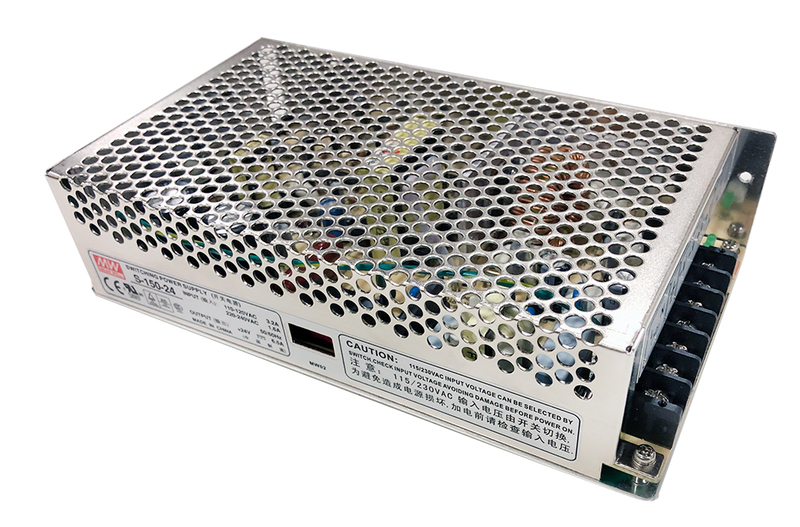 DC Power Supply: Fixed voltage, trimmable ± 5% for up to 50 amp output. • Dimensions: 19" x 14" x 3.6"
Same as above except NEVER INSTALLED. Supplied in original shipping carton. N + 1 Power Systems power supply and back-up battery charger. 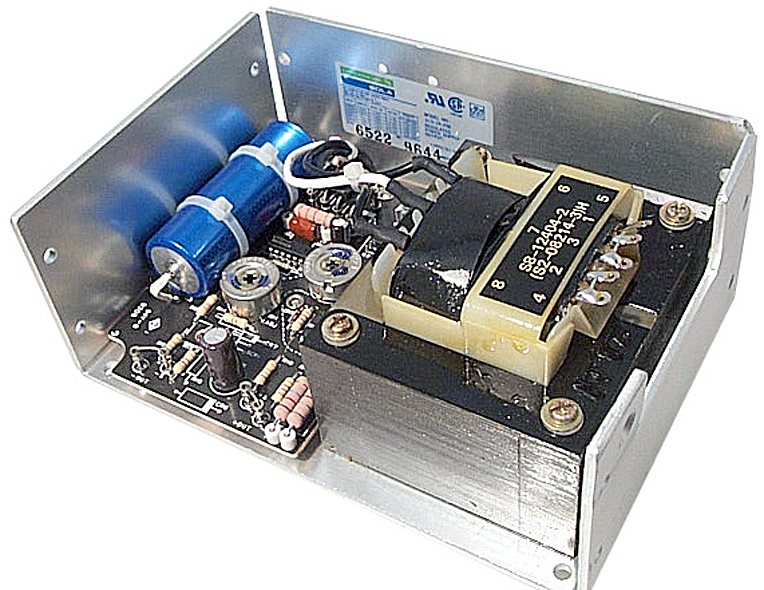 Switching power supply made up of five 10 amp internal supplies. All modules are internally daisy chained and routed to external binding posts. Output terminals L1 and L2 provide full output to power equipment. Output terminals B1 and B2 connect to external batteries to charge them when ac power is available and automatically provide battery power to the load when ac power fails. Battery charging current is limited to 8 amp and tapers off as batteries come up to full charge. Includes front panel module status LEDs, temperature fault LED and switch-selectable analog metering of output voltage or current. DB-25 connector on rear panel provides module status outputs, temperature fault output, dc output and 5v DC at 250 mA. Removed from service. Batteries not included. 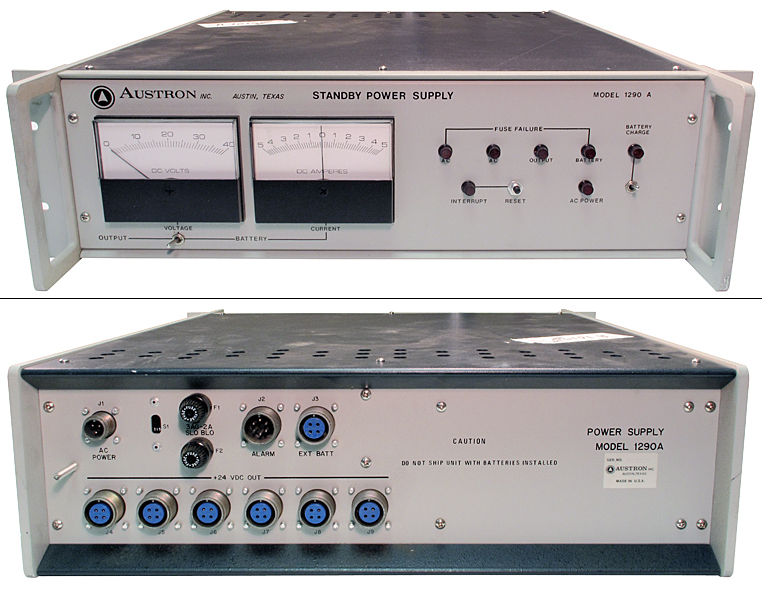 Lambda regulated power supply. Used. 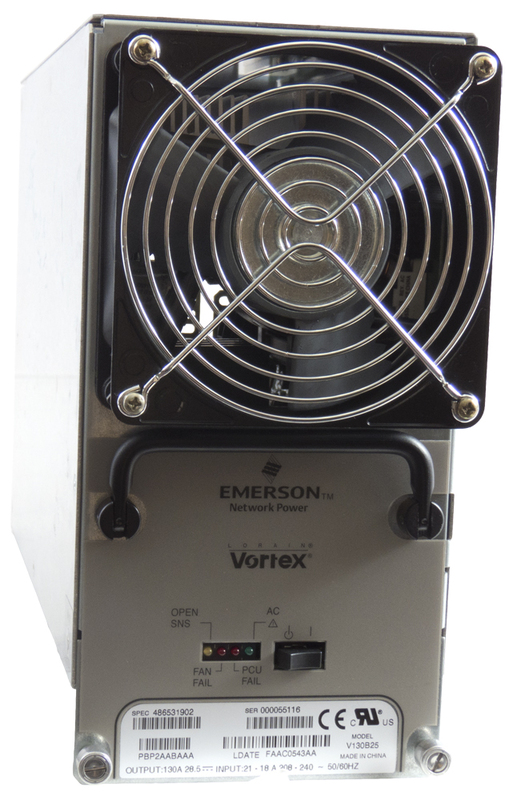 Emerson Vortex network power supply. Brand new in factory box. 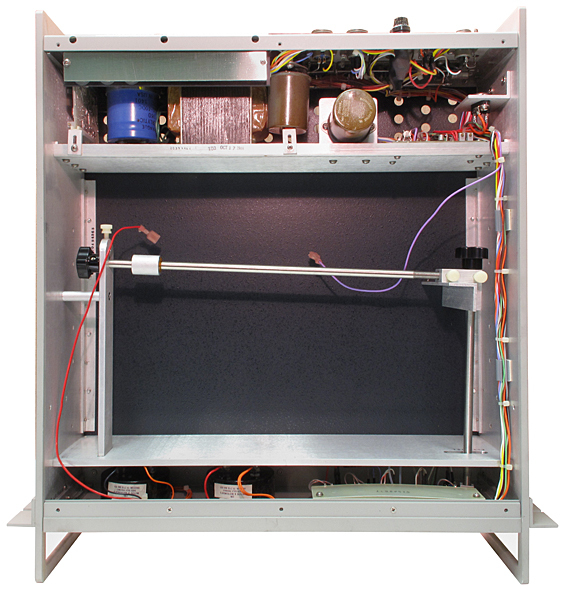 • Dimensions: 9-1/2" x 5" x 14"
Variac (3 section) controlled selenium supply. 3 phase 230vac input. Metered at 32v DC and 100 amp but don't know operating parameters. Sold as is. Weighs about 200 pounds. 28" x 16" x 18" high. LORAIN Flotrol Rectifier is an industrial battery charging / monitoring device. Lots of cool parts too. Large low voltage transformer, rectifiers, filter caps, voltage and current meters. Input in 120 vac @ 8.75 amp. Rack width @ 19" x 24-1/4" high x 13" deep. Used, removed from service but appear to be in good, working condition. Technipower unregulated mil-spec power supply. Hermetically sealed. Terminals and six 1/4-20 studs on bottom. No box or contract. NSN: 6130-00-499-0735. Acopian dual voltage DC regulated power supply. Octal base plug. NSN: 6130-00-179-9252. 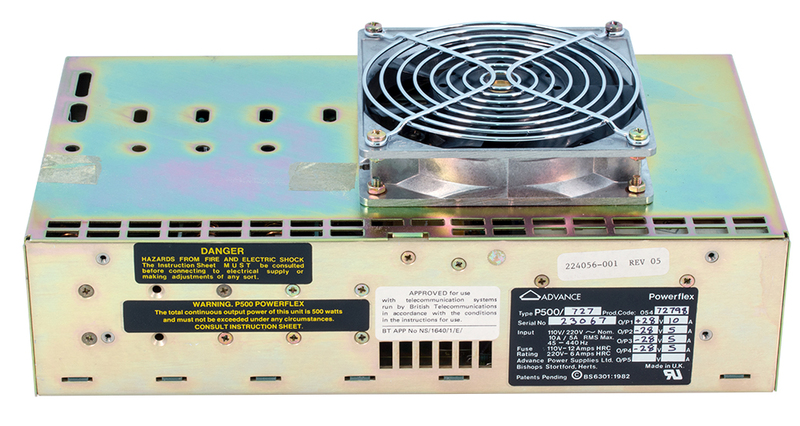 • Dimensions: 4.15" x 4.85" x 3.3"
Technipower power supply. 28.0v DC (trimmable) @ 3 amp. Input: 105-125 vac, 50-420 Hz. Hermetically sealed. Terminals and four 1/4-20 mounting studs on bottom. 5" x 6-1/2" x 7" high. No box. DLA400-83P-6758. Power / Mate Corp. power supply. Hermetically sealed. No regulation. Needs external filter cap. 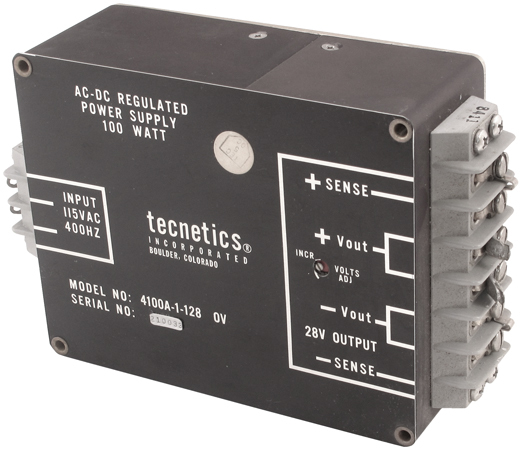 • Dimensions: 3-1/2" x 4" x 5-1/4"
Tecnetics power supply. Input and output terminal strips. Voltage sense circuit. NSN: 6130-01-045-7968.